Looking for other CPU holders? Keeping your computer tower safe and accessible is a priority. 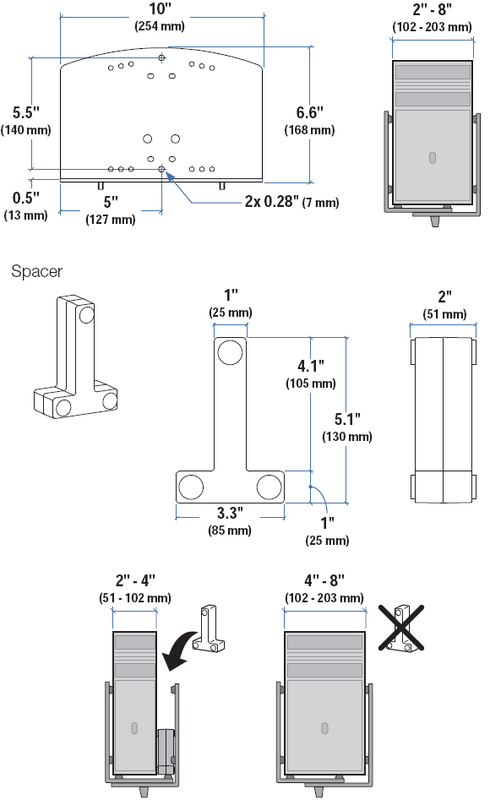 Ergotron 97-468-202 is a universal wall mount CPU holder that can also mount to any sturdy vertical surface including Ergotron's vertical wall track. Use this CPU shelf in public areas that don't have a proper desk like hospitals or lobbies to lift a computer tower off the floor and onto a more accessible area like the wall. Using a wall mount CPU shelf helps connect shorter power cords between monitor and CPU, or create a more available access point for height adjustable or moving workstations. This desktop CPU bracket has fasteners that lock the power supply in place to keep it steady and prevent it from falling. With 6" of width adjustment, this wall mount CPU holder is universal, fitting almost any computer tower, and mounting CPUs up to 40 lbs.